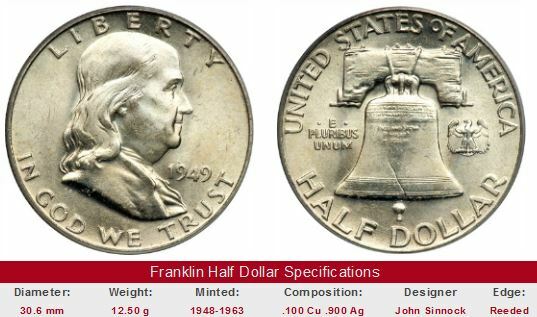 A Review of the Franklin Half Dollar Series and key dates. Benjamin Franklin was one of the nation's most influential Founding Fathers. A skilled negotiator, he convinced France to lend aid to the American colonists in their quest for independence from England. During the summer of 1787, he successfully mediated disputes that threatened to derail the drafting of the U.S. Constitution. Franklin was also a leading author and scientist of his time. It seemed only fitting that Franklin be honored on U.S. coinage for his contributions to America. So, in early 1947, Mint Director Nellie Tayloe Ross asked Engraver John Sinnock to design a half dollar bearing Franklin's image. Fourteen years earlier, Sinnock had prepared a Franklin medal, and this model served as the inspiration for the obverse of the new half dollar. The reverse featured the Liberty Bell. Like Franklin, the famous bell was associated with the city of Philadelphia and the birth of freedom in America. Sinnock died in May 1947, before completing his work. The duty of finalizing the Franklin Half Dollar fell to his assistant, Gilroy Roberts. Federal law required an eagle on every U.S. coin larger than a dime, and because Sinnock omitted the bird, Roberts stuck a tiny eagle in an open spot on the reverse. The Commission are not satisfied with the model of the reverse. The eagle shown on the model is so small as to be insignificant and hardly discernible when the model is reduced to the size of a coin. The Commission hesitate to approve the Liberty Bell as shown with the crack in the bell visible; to show this might lead to puns and statements derogatory to United States coinage. The Commission disapprove the designs. 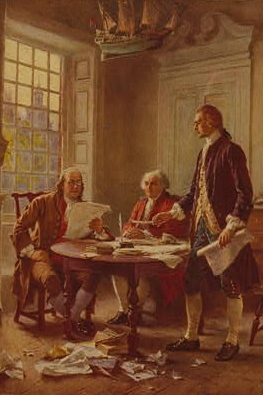 Thomas Jefferson, standing, wisely sought the counsel of Benjamin Franklin, seated left, and John Adams, in writing the Declaration of Independence. The Commission recommended a public competition to find a new Franklin Half Dollar. Since the Commission functioned in a purely advisory role, the Treasury Department opted to ignore their advice and approved the design rejected by the Commission. The first Franklin Half Dollars were released in 1948. The image of Miss Liberty had been a fixture on U.S. coinage since its humble beginnings in the 1790's. The issuance of the Franklin Half Dollar completed the transition from the allegorical Liberty to a real person from history. Franklin Half Dollars were minted for only 16 years. The series was abruptly ended in late 1963, following the tragic assassination of President John F. Kennedy. Congress voted to commemorate the fallen president by placing his profile on the half dollar, bringing the Franklin Half Dollar series to a premature demise. Be sure to buy only examples that have been certified by one of the four leading grading service companies: PCGS, NGC, IGC, or ANACS. The "FBL" designation comes too easily for some of the other grading companies, which leads to disappointment by buyers lured by "bargain" prices. Doing business with a dealer having a good record of customer service makes a lot of sense, too. The left hand side of each "Sales Box" is value trend data over a very long period of time for a coin of that date in MS-65 FBL condition. The percent annual increase is computed for comparative purposes. The right side of the box is a link to eBay US coin auctions, that pulls all FBL Franklins of these dates in a range of conditions currently for sale. Keep the advice in the paragraph above in mind as you sort through the offerings.